* Detachable Rear Door with Cable Port Allows Convenient Cable Use * Industrial Grade Recessed Spring Loaded Split Dish Butterfly Closure Latches with Padlock Tab with a Shackle Opening of about 7mm. * Heavy Duty Ball Corners w/ Stacking Dimple On Bottom Side Allows for Centering and Stability when Stacking Multiple Units. * ATA-300 Style Durable Transport Case is a Heavy Duty Professional Style With Industry Recognized Impact Standards Ideal for Safe Travel. * Well Riveted Heavy Duty Double Edge Tongue and Groove Impact Resistant Aluminum Frame * Electronics Equipment Shown, Described or Referenced is not Included with the Case, the Item is a Case Which Allows you to Use, Mount or Transport your Own Equipment. Engineered to Hold 8u Slant Mixer Rack/6u Universal Vertical DJ Rack System with Full AC Door. 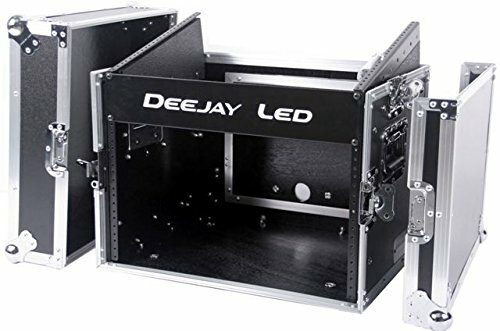 If you have any questions about this product by Deejay LED, contact us by completing and submitting the form below. If you are looking for a specif part number, please include it with your message.